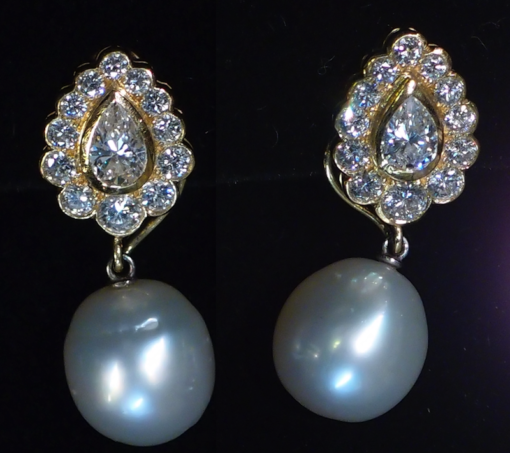 A pair of diamond and (removable) pearl drop earrings. Set in 18ct yellow gold, each of the pear shaped diamonds surrounded by brilliant cut diamonds. One large stone is about .30 carat clarity SI2 Colour G-H. The other is about .32 carat, clarity VS2, colour G-H. The 24 brilliant cut diamonds range from .14 to .03 carat each and the clarity VS to SI, colour G-H.
Total diamond weight 1.95 carats. Height of diamond earring EXCLUSIVE of pearl drop: 15 mm. The pearls are 13 mm drop, 11-11.5 mm diameter, cultured. P.S. ONLY ABLE TO BE VIEWED THURS, FRI & SAT. Time locked in safe at other times, like all the high end jewellery.